Nothing political or nuclear here. For a palate cleanser, or perhaps a dab of bag balm for the brain, here’s an audio production for which I just did the cover art. What’s it about? It’s about 30 minutes. There are just a few off-color epithets, but I didn't notice anything that would warrant more than a PG rating. 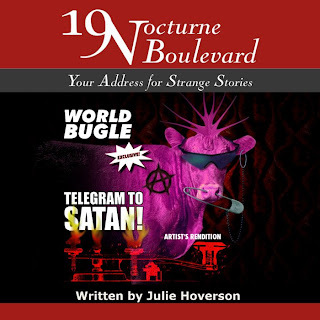 19 Nocturne Boulevard features a variety of original, offbeat audio dramas, as well as Edwardian readings, Lovecraft interpretations and the like. Don’t punch me, I’m not a hippie, but I did play one in my callow youth. Deed it is. It reminds me of our town's first punk rock band in the late '70s, known as the Pugs. I recall one of their songs that is apparently lost to the aether, but its lyrics went, "Mama beats cows, Daddy beats cows, we ALL beat cows 'cause they CAN'T FIGHT BACK!" Upon searching for the band just now, I found that director John Dahl was the guitarist. It's like a little James Burke "Connections" moment, but with no point whatsoever.